...are very cute. 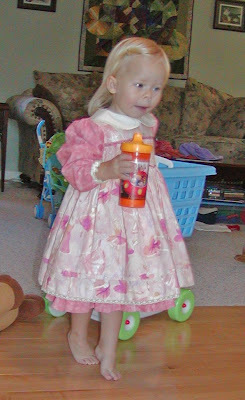 They are a bit ineffective at actually modeling their dress, but that will come with years I think! 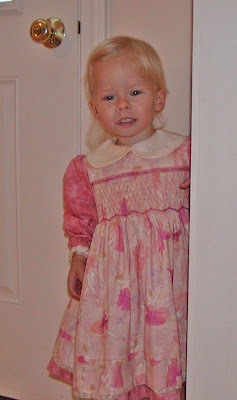 Here's Sophie "showing" me the smocked dress I made for this Christmas. 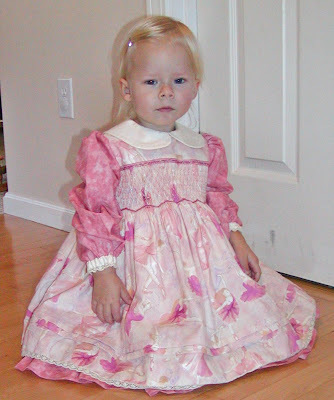 I know it's not really holiday-ish at all, but it is a beautiful colored ballerina fabric, and the color has always been a favorite of mine for her to wear. 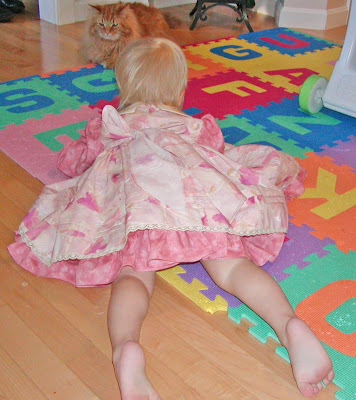 Sophie: ok, she lays down and faces the other direction. The fat fluffy cat is smiling. Ok, this actually got Sophie to at least look my way. The lighting wasn't so good though. Ah...alas, my sweet princess does look my way. No smiles, but a very sweet glance. My only regret with the dress is that I didn't leave another inch on the sleeve length. She'll need that next spring. The remainder of the dress fits her like a glove. Pretty amazing since I didn't really do any fittings short of making a quickie bodice sizer from muslin. 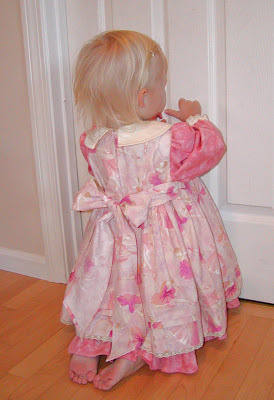 And here's the back, with a nice large bow. I am delighted; it looks amazing on her. Even better yet, she loves it too. Emma left a message on my blog this morning saying she'd received this, so I think it is safe to post a few pictures. I was not expecting this notification so soon - thought for sure mail to Australia would take more than 5 days! 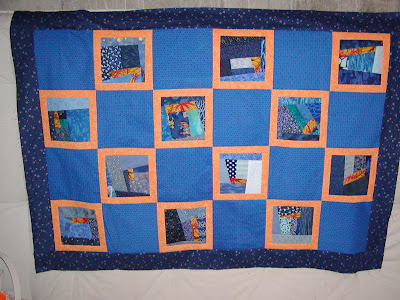 Here's the 22" mini quilt I sent her as a part of the ALQS (BTW...the pictures on her blog are by far clearer and more detailed than mine). Emma sent me my summer 4SQS quilt, so asking Kate if I could have her for a partner was kind of so I could return the favor. Once she said yes was when all of the nerves and trepidation kicked in. 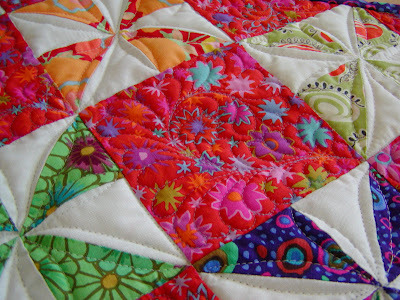 You see, Emma is quite the master quilter - she always knows which colors to pair together. 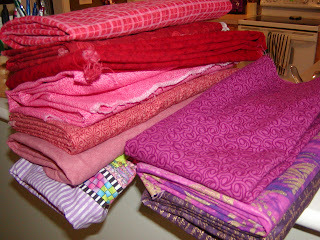 Then again, she has nearly 1000 yards in her stash to select the best color combinations from! 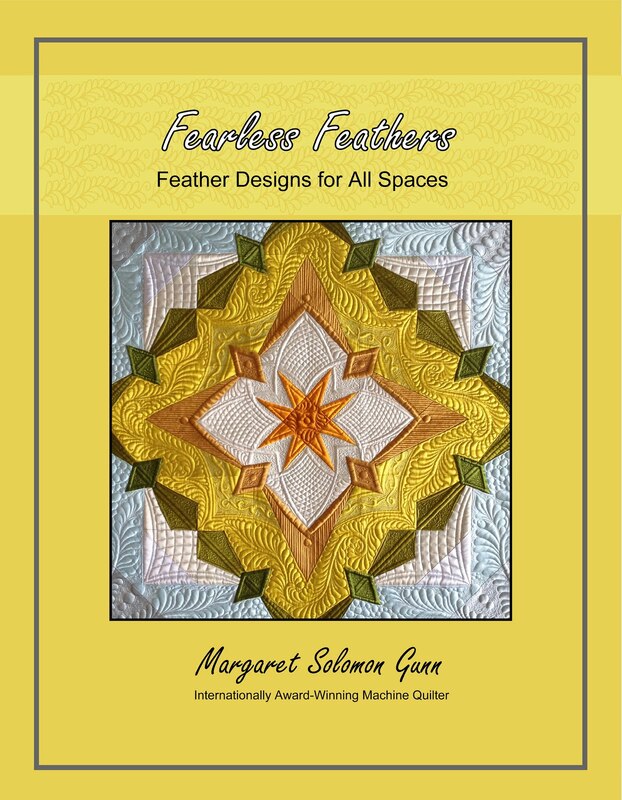 She's a fantastically accurate piecer -- a very technical piecer, and a spectacular machine quilter. I was kind of daunted by my choice. So I took off on vacation in August with my sketch pad. All I knew was that I was trying to design a "scene" and I really wanted it to be Christmas-like. Kate told us to actually avoid something like this, but when I have an idea in my head, that's about the end of it! What I sketched up was a view from outside of a house window, looking in at a family's Christmas tree. Other details were yet to be determined. The scene has a fireplace with stockings hanging. The "E" and "J" are the initials of her children. These were previously Photoshopped out of my cryptic sneak peek so as not to give the surprise away. 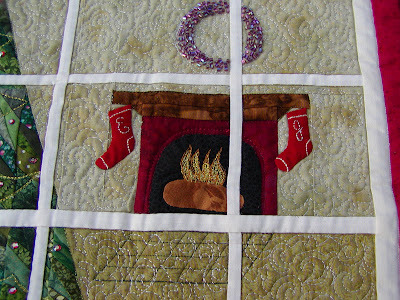 Above the mantle is a wreath done from tiny beads. It just adds the right amount of shimmer. After all, it is about Christmas. The tree is made from about 10 fairly small paper-pieced units that use lots of the scrap greens that I have in my stash bag. Why I chose to actually paper piece these is beside me now. They could have been free pieced just as easily! I quilted the garland in metallic thread over the tree, and added red Swarovski crystals as ornaments. 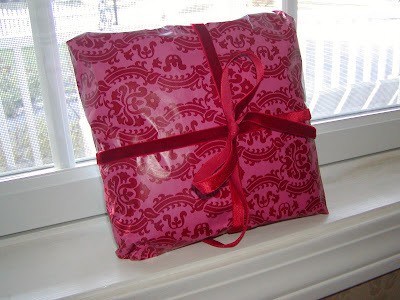 There is a present done from a shiny red fabric. Again, a little more subtle shimmer. I hope Emma likes it. FYI - These were applied with a glue which is clear and hand washable. And here is the overall piece. I apologize if the mullions which define the window panes appear to be a tad wonky at times...these are very hard to hand-sew perfectly straight! I wanted the candle in the window. In December, I love to see the window candles in houses. To me, they just symbolize hope. 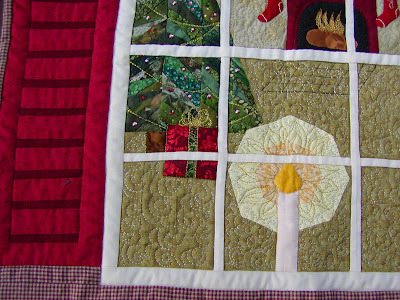 And that is what this quilt was intended to be about...that youthful, hopeful optimism that is most commonly seen in the eyes of a child at Christmas. Pure Joy. I don't profess to be a great machine quilter, and quite honestly, I procrastinated on the quilting of this for weeks because I was timid of screwing it up, and giving Emma something well below her standards. 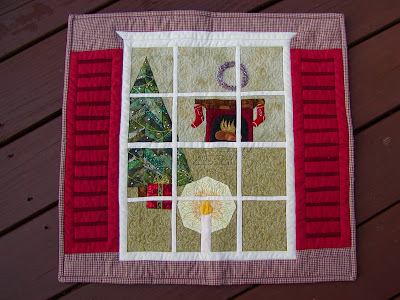 Finally, I chose to do much of the quilting with stitch-in-the-ditch around the window panes and shutter slats. In each pane, I free-motion quilted with a white rayon to portray the illusion of a frosty pane, as though it has just snowed. I entitled the quilt "Believe" because as much as I may sound like a Christmas curmudgeon, I was a long-time Santa Claus believer. I think everyone needs to believe in something hopeful at that time of the year, whatever your beliefs may be. As I sit here in disgust, watching what appears to be snow flurries (OK, they are random falling flakes, but still...IT IS October!! 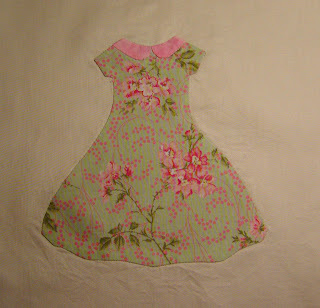 ), I have been glueing and pinning my next two little dress blocks. By glue, I mean...I use a glue stick to stick the fabric edges around the freezer paper. 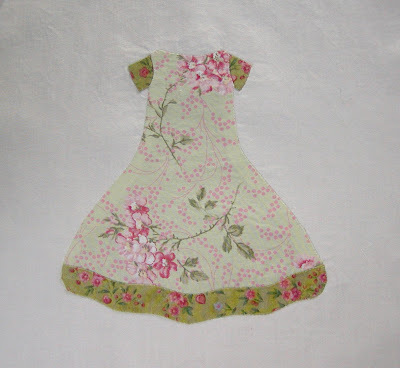 The dresses are hand appliqued onto the background fabric with little tiny stitches. I have been satisfying my need for mindless sewing and scrap eradication this week. 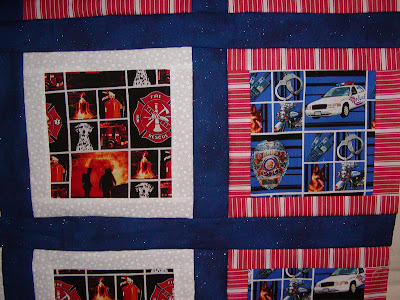 I have had this police & fireman fabric since I won it free last year. It is a good feeling to use it up (make way on my shelves for something lovely & tasteful). Critique aside, some little boy will love it. It still needs another outer border and finishing, but I am building my stash of flimsies that I will finish over the long winter (and I do mean long!). These scrappy blocks were actually fun to make. They came purely from my scrap blue bag, except for the snippet of Kaffe Fasset yellow in them. I gotta admit, I HATE blue and orange together, but those blocks were just calling for that bold orange bordering. You see...I did my undergraduate work at University of Alabama, and one of our staunch rivals was Auburn - blue & orange ! For decades I have hated the two colors together. 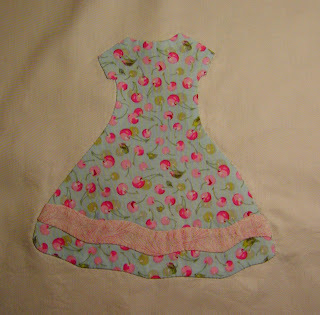 Here's my other project in the works...Two more pretty dresses. They are not complete, as I intend to add some embroidery detailing. 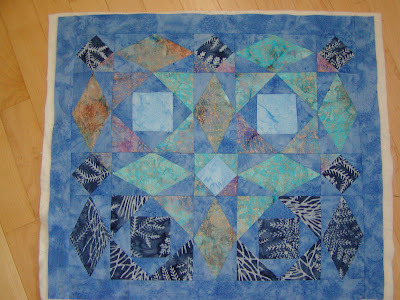 Now, I need to actually finalize the quilt's design before going much further. 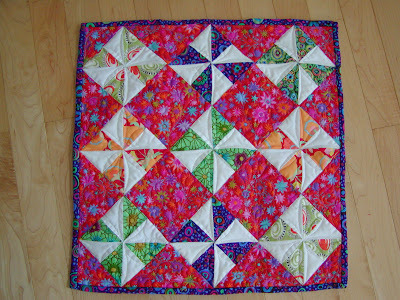 I am leaning towards making the quilt's top be all squares (18 in all) that are different style and color dresses. THey will be bordered with 1-1.5" borders, and sashed with a sashing to look like ribbons & bows (stay tuned to see this!...it is on paper right now). Keep a lookout in your mailbox. 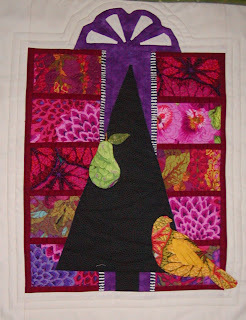 I sent out my ALQS quilt a few days ago. If you see this...it's from me. I have been playing with the fabrics I showed last time, making a couple of blocks for my daughter's twin bed quilt (to be finished next year sometime). I want it to be super feminine, colorful, flirty and fun. I saw this dress pattern done recently, and drew up my own pattern for one. These blocks are not finished, but you can get the idea. 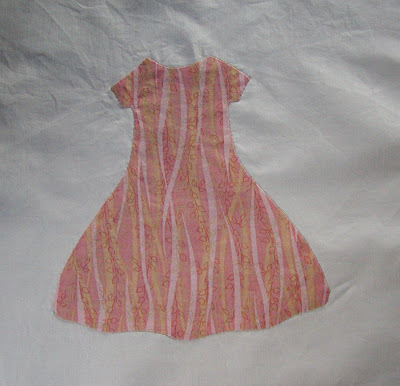 I will be adding an embroidered hanger (as I have seen Louise do recently), and embroidery detailing on the dresses. This is a bed quilt design in progress, so I have not decided if I want all 18 blocks on the quilt to be dresses (all different, but same general shape, idea, etc), or if I want to vary the block designs to include dresses, large dahlia-style flowers, and a few other things I have in mind. 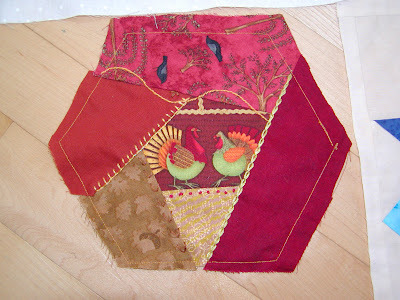 To applique 18 of these would certainly take a while (about 2 hours each block since my stitches are very tiny so that quilt will withstand the rigors of a child)! Any cute ideas from my readers??? yes, I know the collar is a tad wonky. Oddly, I am not too bothered by this. Boy, I love those Lakehouse Dry Goods cherries!! 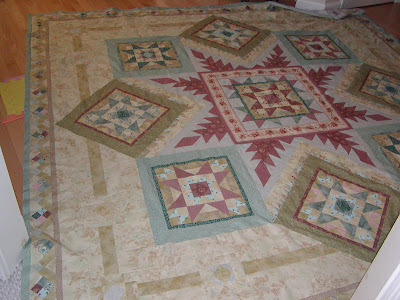 Here's a peek at a quilt I whipped up in the last week. It is a Secret Santa mini. I'm just cursing myself for forgetting to embroider the partridge's comb atop of his head!! I may also add some Swarovski crystals to the tree for a tad of holiday shimmer. I really love the fabrics, and my design concept came out well, I think. I believe that the end recipient will like it. 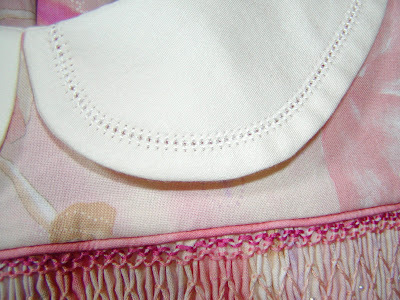 I have actually been very busy sewing this weekend on a couple of secret projects that I cannot post about just yet. I am trying my hand for the first time at making a quilted bag. It is a hair tedious, and even more so because I am attempting to write a tutorial to document what I am doing. One bag is done, and another is in the works. I also have done a holiday wall hanging in the most fashionable of fabrics. This one I can hardly wait to show. 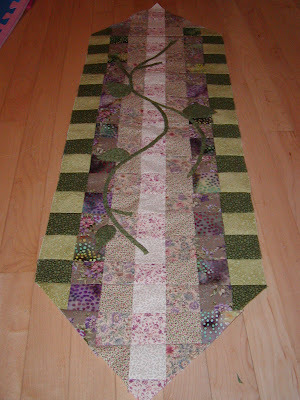 The flimsy is ready to quilt and bind this week. 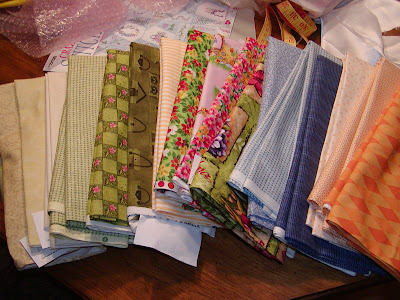 Until there is really something to post about, I will leave you with this dilectable assortment of luscious fabrics that I have collected over the last year. 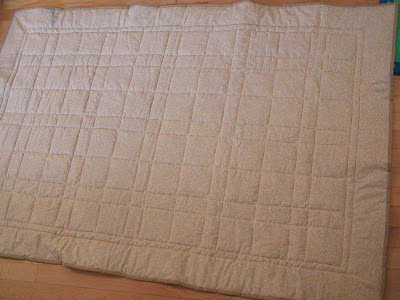 I am in the planning stages of my 2 year old daughter's quilt, when she gets a real bed next year sometime (or even the following year). I expect that this quilt may take me some time, so I've planned ahead. These all went to the washer yesterday. I am officially ready to start! And here is the remainder of the free stuff I got last weekend after turning in my 21 Project Linus quilts. I think that the reds and purples were in the washer when I photographed the rest! 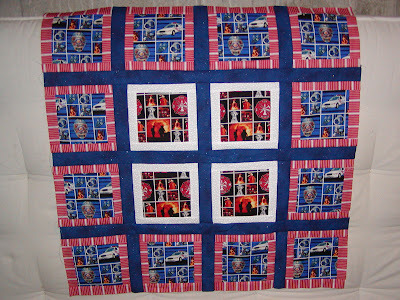 I entitled this quilt "Believe". It (as you probably can infer) has a holiday sceene, evoking many of the dreamy memories from my childhood. As a very long-time believer in Santa Claus and the total magic of Christmas, the title just seemed appropriate. 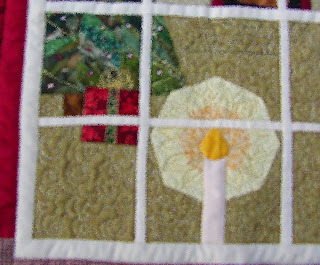 But as you can see, I have Photoshopped the pictures a little to both blur the details and to erase the items which I have incorporated to personalize the quilt for the new recipient. Boo hoo...you'll have to wait another week or two until the quilt is received. I'll probably mail it this coming Tuesday. It has hand applique, lots of piecing, little embroidery, little beading, and machine quilting. I'm sure you can tell from the "peeks" that it is a holiday sceene. I know, I know...we weren't supposed to do anything of this topic, but I had this idea well before the swap, and figured it would be well received. I can always include return postage in case she just wants to return it to me (but I'll be she'll just be pocketing the $$). And so, this quilt may just be your's if you Believe. 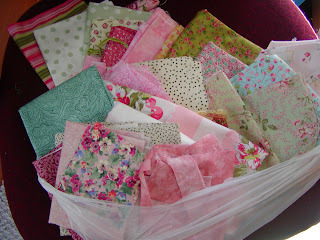 I spent my sewing time this weekend puttering in my scrap bags. After cleaning up my sewing space, I realized how overflowing each color bag was, so I endeavored to reduce that a little. I did squares like this from 4 of my bags: red, green, yellow, and purple. I feel like I hardly made a dent! 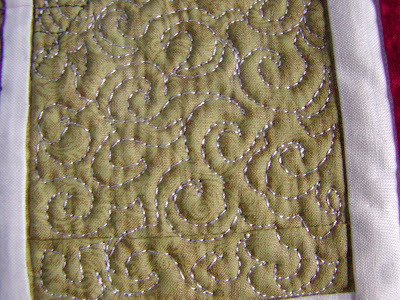 Here's a closeup of the sashing and background fabric. It's so fun! I got 6 yards of this for free from the last Linus Blanket event. 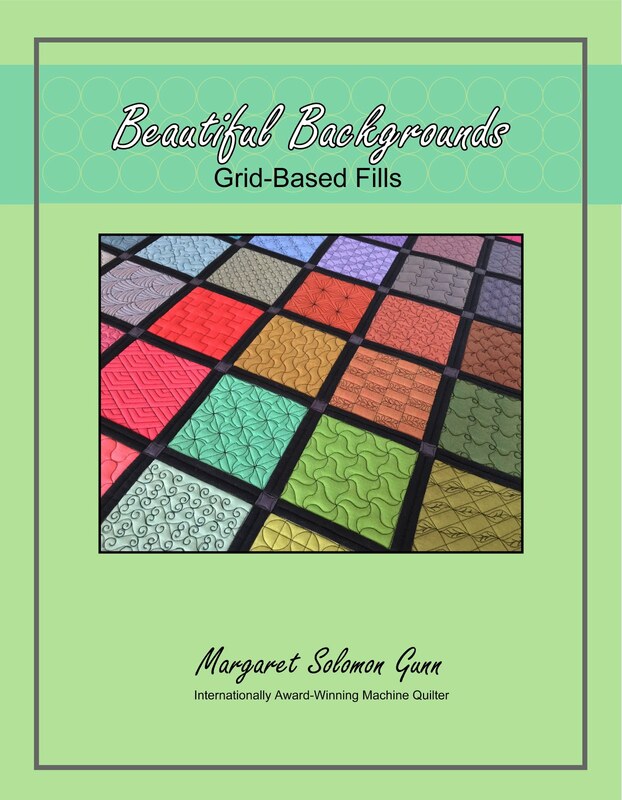 So girly and fun to play with brightly colored blocks. Some preteen will love it. And a quick glimpse at the 20+ yards of new stuff that came my way this weekend (minus the reds, pinks and purples that are up at the washing machine - that's probably a third of the loot too!). Many of them are SouthSea Imports and RJR. It all feels so smooth - love to dream up some new projects now. 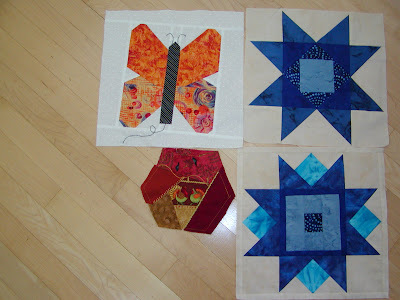 First things first...kid #1 to school, and two birthday blocks for next month that need designing. 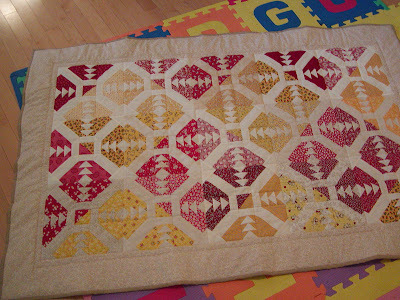 I am surprised how long the last 4-1/2" border actually took me. It is heavily pieced with constructed triangular sections. 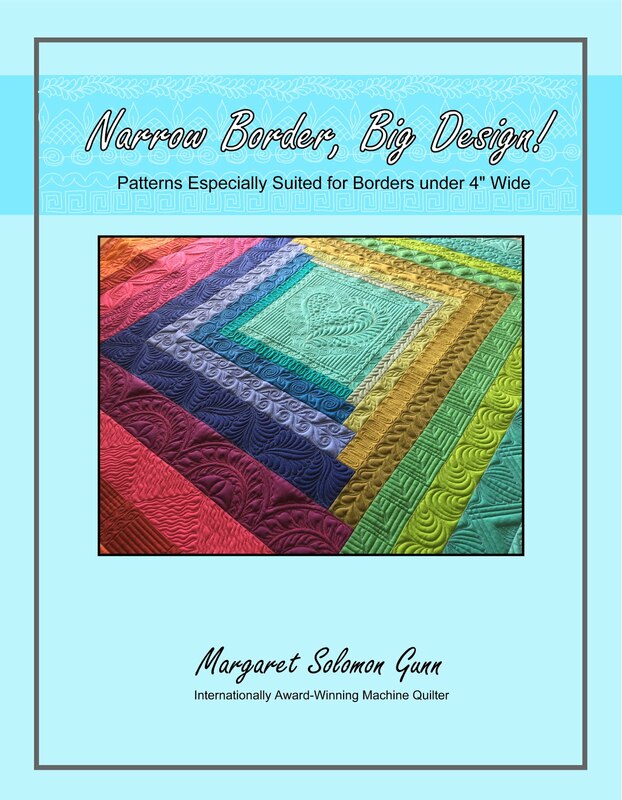 I think I would estimate this border to have taken about 15-20 hours. It seems high and ridiculous, but every time I thought I was going to sew for 2 hours and "finish it up", it still was nowhere close to done. And a nice blurry closeup. 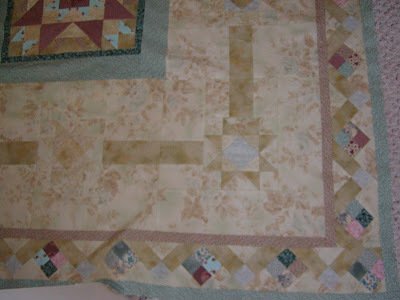 I am not really satisfied how the corners ended up, with the borders mating together in a somewhat funky fashion. In a perfect world, I'd take this out and do something different. But where it is eventually going on my bed, I am unconcerned/unbothered. The colors photograph horribly. I may try some outside in the grass today. 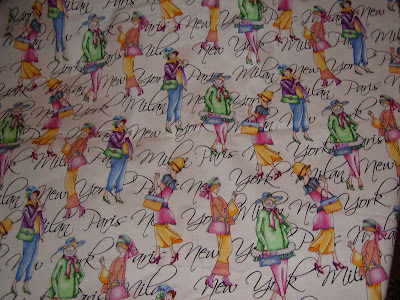 These fabrics in person are absolutely lovely. The deeper olive has little gold metallic flickers. The large floral that is most of the wider border has hints of aqua too. While it is more subtle and earthy than I envisioned before I actually selected fabrics, I do love the end result. I had never made a feathered star, nor had I ever sewn so many traigles (or cared that I didn't chop off points!). It carries the "Summer" colors I love - the earthy tones to remind me of the sand and dune grass; the turquoises and deep greens that mimic the ocean water, and the hints of red and pink which are our very transient flowers. It is most definitely a cooler version of summer, which again, is most appropriate for me, living in Maine. 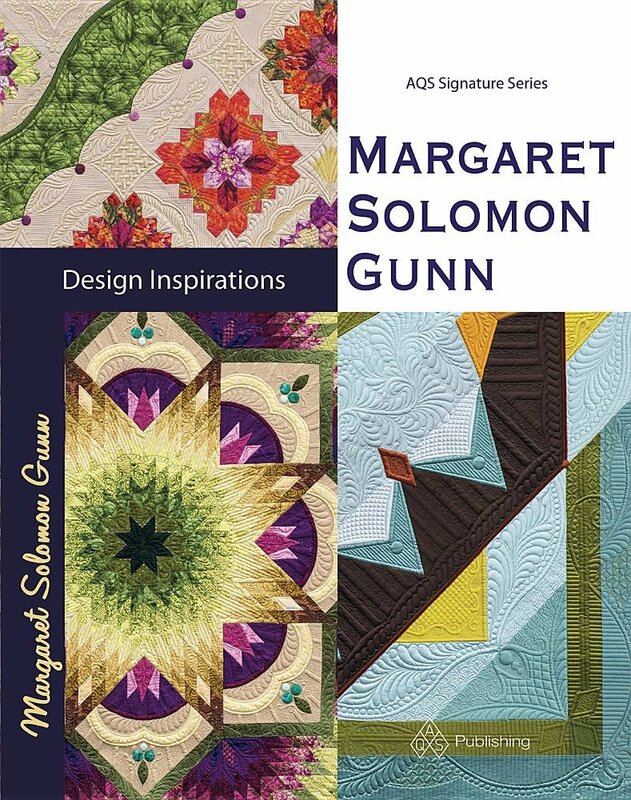 I would love to have this hand quilted, but have to wait until one of my quilts returns from the Amish to make certain that this is who I want touching this quilt. 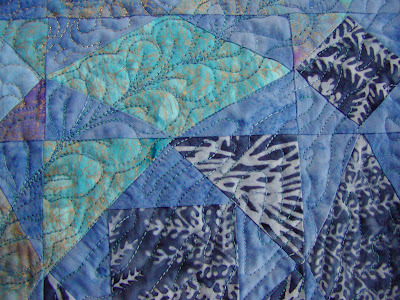 I believe that this is square enough to be machine quilted, but even then I am not certain! I'll worry about that come January when all the Christmas sewing is completed. Bernadette from Australia sent me this as a part of Toni's Miniature Booty Swap. I was fearing that my quilt might be lost in the mail as it was late, but it arrived on the weekend with a few goodies. She sent several Cadbury bars, which of course we can buy here, but what was fun was they all had indiginous Australian animals on the wrappers...wombats, kangaroos, platypus, etc. My kids loved that (naturally I had already eaten the chocolate!!) 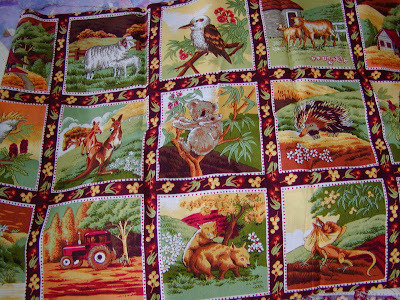 She also sent a piece of the fabric I show below that has some of the same animals. This will be most fun to use on a Project Linus quilt. Many thanks Bernadette! 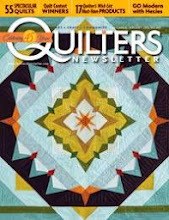 Bernadette claims to be a novice piecer, despite being a professional long-arm quilter. The shot below shows how nice her great equipment can make uniform feathers. I only wish the thread didn't blend so well so that you could see them better. The pictures on her blog are a little better than mine. 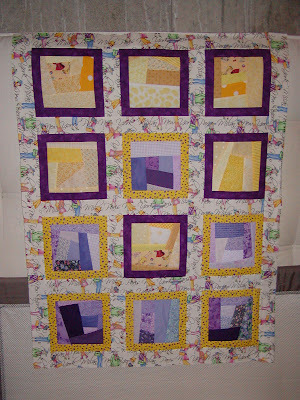 You can also see the awesome quilt that Rose Marie sent her for this swap - I just love that one! 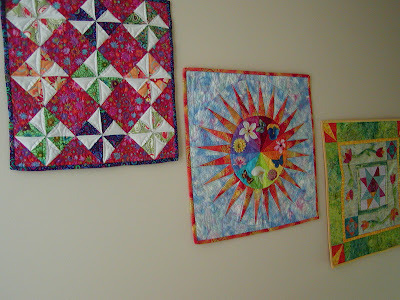 I got around to hanging a few quilts I received over the summer yesterday. These are all very bright, and though I like them all a lot, I just didn't really know where to put them. Orange is just not my color, and does not really go with my home's decor. I actually wear plenty of orange in the summer; I just tend to decorate in the jewel tones (deep cranberry, purple, various shades of green, etc.). 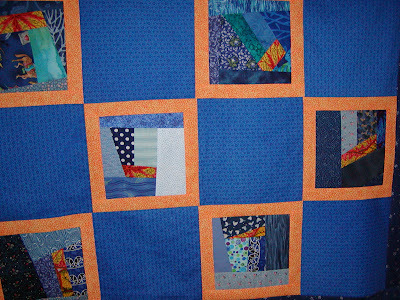 With all three quilts together, the orange seems less bold, and they go together nicely. I had a hard time getting a good shot as this is in my narrow hall/stairway. I am nearing the point when I know my husband will want to know "just how many more quilts will I be hanging on the walls?..." left-to-right: Bernadette's Booty 2 quilt, Emma's Plant in Full Sun from 4SQS Summer, and the Spring Fling Round Robin 1 quilt. 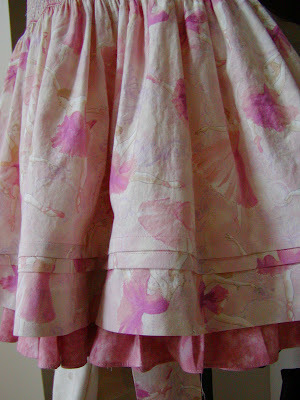 ...making sweet rows of double pleats in a pretty dress. ...whipping (ha ha...it took 12 hours to get my cuts and seams correct!) up a wedding gift. ...adding finishing touches on my October Birthday block swap blocks. ...laughing that anyone really will appreciate my turkeys and crows!...it is supposed to depict November. ...wishing I could actually finish this table runner, started this time last year. Soon I promise! 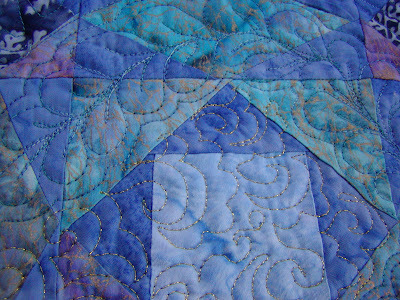 ...and wishing I could show this quilt, which is for my ALQS partner. This is a glimpse of my snow. In addition, I have 2 mini's awaiting binding to be hand sewn, two dresses in need of much handwork and hemming. I can happily say that I added a 2nd border to my spring Fling Round Robin square, and it is all ready to be mailed to a secret person for quilt finishing. It's a spicy little number...I hope the final owner likes salsa, because that is what the color and desogn of this quilt remind me of. And lastly, I did actually receive my Booty quilt yesterday from Bernadette of Australia. I will post this with pictures later this week. 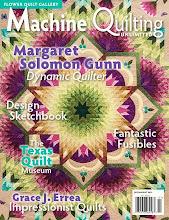 She's a very skilled machine quilter. Makes me drool, and retreat promptly to my machine to practice! I had a harder time too than anticipated sewing these together. They were all made by different people, and seams were pressed differently. I did not anticipate not being able to easily get smooth seams and joints. The end result is actually very fetching; I like it alot. All blocks are made from various 1930's repros, as I thought they'd be fun and playful for the children. It's in red and yellow so that it is fairly gender neutral too. 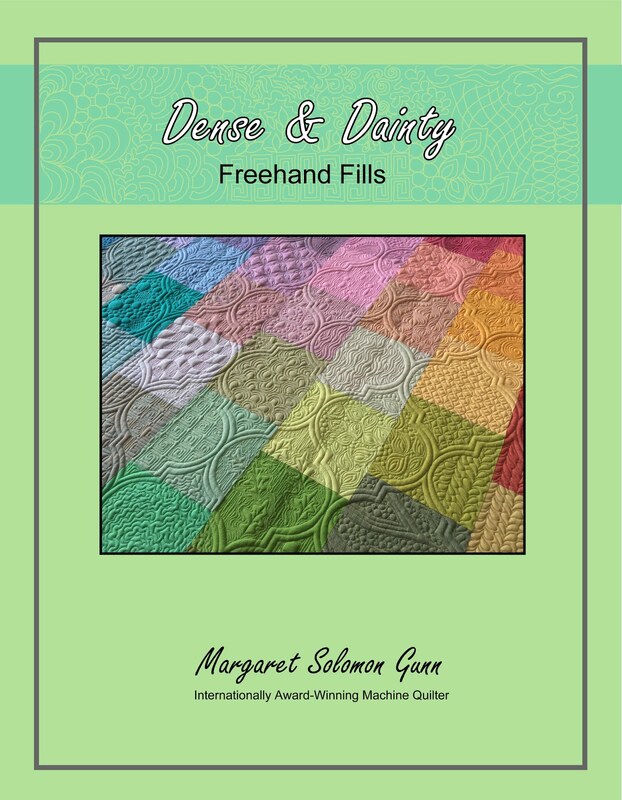 I wanted to do free motion quilting but mistakenly took advantage of some free batting (which I thought was thinner than it really was). In the end, I was only able to straight-line (or sort of!) quilt in the ditch. Here's a quick look at the back. I will no doubt find a good and charitable use for the remaining blocks. Nobody should feel at all guilty! 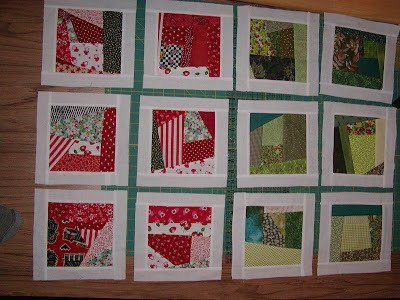 Many thanks to the great ladies in this block swap for their lovely blocks! !